If you can't find where the undiscovered master chefs are serving adventurous diners, here are some starting point for your journey to underground dining. NEW YORK (MainStreet) — Scoring tickets to trendy pop-up dining events is typically difficult, reserved for the ultra-hip and in-the-know. Jeremy Baras' new PopUp Republic website helps level the playing field. It's a directory of hundreds of pop-up events across the country — dates, times and details regarding who to contact to get an invite or buy a ticket. Simply sign up for email notifications and you've gone from outsider to hipster. Baras started the site because, he says, if anything needs help being found, it's a pop-up. "I wanted to be part of this emerging industry in the United States," Baras says. "I think we're just starting to scratch the surface of the popularity of pop-ups. It's becoming part of the mainstream in the sense that people are just starting to realize how much sense it makes to open pop-ups, given their nature and what you can create with them that you can't create with a permanent restaurant. Chefs can be creative with menus, and there is still an element of surprise and exclusivity." Baras says his is the only website devoted to marketing pop-ups — a telling detail for a movement that remains hard to even describe. 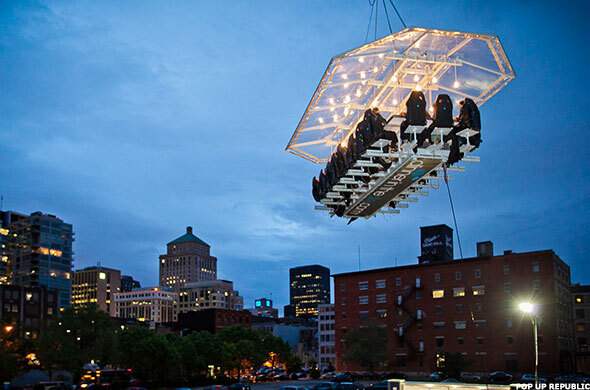 "Private dining clubs," "pop-up dining" and "underground dining" are used equally in referring to the exclusive, ephemeral events, some of which are put on by just two or three people with no professional cooking background, others orchestrated by businesses managing events in dozens of states. What they have in common is a desire to take dining in a new, more fluid, direction, one based on unique dining experiences that are not confined by permanent locations or fixed ideas about what will be served, how or who will be cooking each night. "A lot of times it's a group of chefs who are contemplating whether they want to open a permanent restaurant and will use pop-ups to test out the food or location," Baras says. "The other big segment of pop-ups is chefs who don't want to be constrained by the expenses or the lack of excitement of a permanent restaurant." But really that's just scratching the surface of why pop-ups are being held more and more across the country. Brian Bordainick, the 29-year-old founder and CEO of Dinner Lab, one of the bigger players in this emerging market, finds the idea of a permanent restaurant serving just one type of food almost difficult to understand. "When you look at concert venues and the way they're set up, they allow you to rotate talent. But for whatever reason, restaurants did not develop that way. We wanted to be able to rotate talent," says Bordainick, whose pop-up business has spread nationwide in just two years. Bordainick created what he calls a membership-based social dining experiment that unites undiscovered chefs from all over the country with adventurous diners. The chefs prepare food speaking to their background or heritage, or are perhaps showcasing ingredients they're passionate about or testing a new meal. "We're trying to bring new ideas about food to the rest of the world," Bordainick says. Diner Lab is doing that in dozens of cities already — from Atlanta to Miami to San Diego. Membership costs about $175, which gets you notifications about three weeks before events and the chance to buy tickets. (Typically about $60). The location of Bordainick's events are not released until the day before, which he says is less about trying to be hip or mysterious and more about logistics — weather can sometimes require a last-minute venue change for a planned outdoor event, and water pipes have been known to burst in warehouses spaces. Baras was inspired to start his website after seeing a pop-up dining event on the London Eye — a giant Ferris wheel along the River Thames. "Each time one of the Ferris wheel pods came down, customers were served a new course," Baras says. The venues for Erika Polmar's pop-up dining events happen to be the perfect way to spend a summer afternoon. 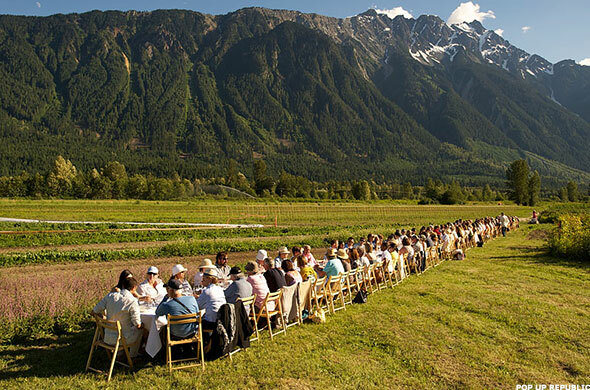 Polmar, founder of Plate & Pitchfork, hosts pop-up dining events all summer on farms in Oregon ranging in size from 10 to 110 acres. The typical setting is a wide-open field with a good view of the host farm. When guests arrive they're handed a glass of wine. Appetizers are passed around and diners mingle. Before the meal is served there's a tour of the host farm, and diners may find themselves picking berries on the way to dinner. The meal itself is served family style on a table set in a tractor row, covered in white lines, china and proper glassware. "The guest experiences this magical, romantic, wistful evening," says Polmar, who has no previous experience as a chef or in the food industry. "My events are a lot less about rock star chefs," she says. "They are about taking people to the place where their food is coming from." Polmar started Plate & Pitchfork to increase awareness of the benefits of eating local foods and reinforce the connection between farms and the food we eat. Her events, of which there are only 14 to 18 each summer, sell out within days. One sold out in five minutes. You can sign up on the Plate & Pitchfork website to be notified of upcoming dinners, and then must buy tickets. (Each dinner serves about 100 people.) Dinners can cost up to $125 to $135 per person. Because pop-ups sell out quickly and not all are found on Baras' site, devotees also sign up for notifications from individual pop-up organizers — a step that may still may not guarantee you a seat at Mike Lee's table. Score a Studiofeast invite and consider yourself extremely lucky. Studiofeast is an invitation-only pop-up experience created by 34-year-old Lee and a few friends in New York. Lee likes to describe his events as a mix between going out to a really great restaurant and having dinner at your friend's place — except this is a really hip friend's place. Who makes really amazing food. "We try to create something communal and convivial, something unique and special," he says. The food Studiofeast serves is ever-changing and has included such things as a Sichuan Seafood Boil and the group's now famous "Last Meal" series — an annual meal based on asking people who register on the website: "You're about to die, what's your last meal?" The 2013 Last Meal event included dishes combining chicken and caviar; Uni and egg; and pork belly and bourbon. "We like to take two disparate things and smash them together," Lee says. For even more detail behind Studiofeast's inspiration and story, there is a beautifully shot video on its website, filled with quintessentially New York imagery evoking the mood of these events, revealing the artistry of the cooking team and leaving you hungry for a seat at their table. Invitations for Studiofeast gatherings, however, are issued only to people who sign up on the site. And events are sporadic — about once a month — so seats are extremely limited. "We try to be pretty democratic about it," Lee says. "But because we're not like a restaurant, demand is going to outstretch supply for us. So really it's the luck of draw." Robinhood has taken off as one of the most popular, commission-free investment apps on the market. But, is it safe?